Manchester City Football Club recognised that fans’ bereaved families had a very real need to mark their loved ones passing somewhere significant to their MCFC passion. To meet this need they created the Memorial Garden at the City of Manchester Stadium. 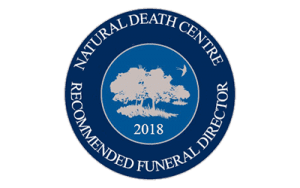 Natural Endings Funeral Services arrange full funeral ceremonies at the stadium. Where better to pay tribute to a loved one’s life than a place where they spent many happy hours with family and friends following their team? The dedicated garden has a mosaic from Maine Road and curved stones from Hyde Road Hotel where City was established. Families can have a ceremonial scattering of a small amount of ashes in this significant space. A quiet private space is available for the service to take place. Families have the opportunity to have displays of their loved ones photos, play significant music, have a toast with the loved ones favourite beverage, and share memories after the funeral over a few drinks.